Are you after high quality storage boxes for an upcoming move or declutter? You’re in luck. Hire A Box offers tough and durable storage boxes of all sizes at highly affordable rates. Whether you’d prefer to hire your storage boxes or buy them outright, we can help. Hire your storage boxes – it’s the cost-effective solution! Because our storage boxes are reusable, we can pass on massive savings to customers who hire our boxes. It’s a much more affordable option than purchasing storage boxes from your removalist – just check out our prices! And not only will you slash the order costs associated with your storage boxes, but you’ll be able to do your bit for the environment as well. Reusable books are eco-friendly boxes, after all. Our large boxes are available for hire for $3.30 and you can buy them for $4.25. Also known as tea chest boxes they are ideal for residential moves. Store curtains, clothes and any light decor item. Medium boxes are the common small storage boxes. Made of sturdy cardboard, they will safely carry around your books, DVD’s or electrical goods. Our medium boxes for $2.40 or buy them for $3.30. Porta-robes are the easy solution to pack up your wardrobe! They come with a hanging rail, making them easy to assemble. Their hire price is $11.50 and sale price is $16.20. 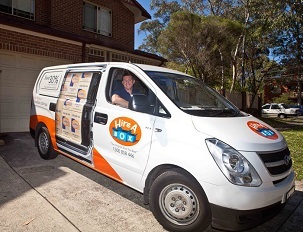 Whether you are based in in Sydney, Melbourne, Perth, Brisbane, Adelaide and the Gold Coast, we can deliver your storage boxes. Our friendly drivers will even show you how to tape up the boxes so that your goods are safe throughout the transit and storage. We’ll deliver your boxes at a time and date to suit you! We love being cost-effective, but we also love being efficient. That’s why we strive to get your moving boxes for you as soon as possible. Just let us know your preferred time and date for delivery when you place your order and we’ll have your boxes at your front door as early as the very same day. To have your boxes collected, just arrange a time, and we’ll pick them up for you. Hire or buy your storage boxes – your needs come first! We’re all about flexibility, so whether you’d prefer to hire or buy your boxes, or even a mix or the two, we’re happy to accommodate you. Just let us know your needs and preferences, and we’ll make sure that you’re looked after. We’ll even drop off additional boxes if you need them. Now that’s service! We make all your storage issues easy by supplying a wide range of quality packaging products including tape dispensers, tape rolls, butchers paper, bubble wrap, marker pens, sofa and mattress protector bags and even FRAGILE labels. Got any questions about our boxes for storage? Not a problem, give our friendly customer service team a call on 1300 858 446.